Janet Sarbanes, “The Poiegg and the Mickeymaushaus: Pedagogy and Spatial Practice at the California Institute of the Arts,” sets the stage for our understanding of the open source studio. If a single building in the style of the Bauhaus could unite all the arts at CalArts, and provide a structure for the evolving educational and social relations, so too our virtual workspace, with each participant connected via the network. This network can be local (LAN) or wide (WAN). It can involve a small group or a global community. It is entirely scalable, unlike the architecture of the past. The community of the arts. seeking the transgression of melting away of boundaries between the arts, a holistic vision of artistic practice reigns in both instances. We now look at the open source studio as a new virtual architecture, operating on the spatial orientation of the network, a system of hubs, routers, modems that potentially connect a nearly unlimited number of computers. This network architecture also facilitates an interplay between the arts, the integration of multimedia forms, various data types converging as sound, image, text, etc. The introduction of social media catalyzes this space to create a network of social relations, not unlike the intent of the original Bauhaus or CalArts, where a single building housed a community of the arts that encouraged the cross-pollination of disciplines. For the construction and equipment I brought the whole body of teachers and students into active cooperation. In the same way, the Open Source Studio is intended, as a data space, to expose the process of making and studying, to encourage crossing over and the sharing of ideas. To use the functionality of the database as a means of dissecting the process, to look for trends, and target key areas to focus conceptually. The Open Source Studio as an architectural form is a “total environment,” a gesamtdatenwerk, a term coined by Roy Ascott in “Is There Love in the Telematic Embrace,” in which like the Bauhaus or CalArts, boundaries of media and discipline are blurred, as are spatial and even temporal boundaries. The structure of Open Source Studio facilitates the integration of student work, and above all, the power of the database to aggregate and consolidate activity into a shared environment for production and research. In this sense, the net architecture lends itself to sparking the realization of the community of the arts in an entirely new type of virtual environment. It was Maury Stein, the first Dean of Critical Studies, who advocated “random life process” in place of structured pedagogy, promising to turn the school’s liberal arts department into a “a place of unembarrassed ferment… a spatialized educational environment (Larry Miller) in which radical energy (could) be sustained, deepened and transformed. In this sense, the hyperlink represents the spontaneity of learning, the ease in which one idea can be tied to another, the powerful nature of information architecture to facilitate the non-sequential association of ideas and concepts. Not only does Open Source Studio enhance students’ media skills, but it gives them a heightened sense of cooperation, teaching them the necessary collaborative skills to work in a highly interdisciplinary medium. Participants were filmed as they worked, and the video recordings were immediately played back for them to watch, highlighting the performative aspects of their activity. The OSS space facilitates this exchange in multiple ways, through both synchronous and asynchronous forms of discussion, but what is interesting is the way that discussion, blogging, communicating is all recorded, archived and tagged so that information brushes up against information in active ways that are enhanced by the information technology, creating a dynamic, hypermediated environment of knowledge that can be endlessly used, reused, linked to, accessed, copied, pasted and rearranged. Everything is interconnected, or “deeply intertwingled,” as Ted Nelson famously said, in OSS. takes on new meaning in OSS as a call-to-action for everything you do and say to be recorded and archived as an act of the creative process, a “data-happening” as it were, in which the information system functions as an active agent to spur a continuously “permanent” record (as in Vannevar Bush) of creative activity. Where as the original intent of the Poiegg (embryonic architectural idea) or “Poipoidrome” as Fillou dubbed it. Though spatial practice has clearly proved vital to the pedagogical project of creating a genuine “community of the arts,” it seems that the nature of that space cannot be too fixed if continuous experimentation is to occur. “Building” must remain a verb, a “happening,” as in the early days of CalArts. 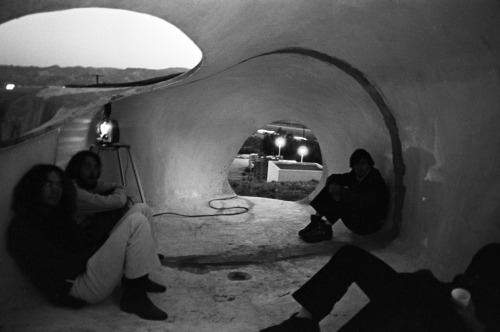 It is perhaps only the Poiegg, which is to say, the unbuilt or other-built space we contemplate from within the building, that can house an entity as paradoxical as an “Institute of Permanent Creation.” You could say that OSS is always in an embryonic state of potential, because it is infinitely expandable, yet, its data is housed as a permanent record (or as permanent as digital media might be). Perhaps the paradoxical nature of an Institute of Permanent Creation” might be reconciled in OSS.